It is election season in Moscow. On September 8th, for the first time in a decade, Muscovites have the opportunity to vote for a new mayor. The election is a small concession to Russia’s political opposition, which saw a vocal Moscow-based middle-class take to the streets in 2011 to express their disillusion with a presidential party that was stifling political debate. Shortly after the last mayoral elections in 2003 Putin reinstated direct appointment of the Moscow mayor and regional governors as part of his assertion of a “vertical of power” throughout the country. In the case of the Moscow mayor, that decision was quietly reversed following the 2011 demonstrations: a PR coup, many said, that would not really affect the nature of politics as usual. Today the billboards are out, with their pictures of mayoral candidates in decisive poses. There are slogans that speak to the concerns of an increasingly aspirational middle class (“Order, Comfort, Plenty” for Zhirinovskii’s LDPR; “Moscow power under the control of Muscovites” for the liberal Yabloko party). State buildings are getting a hasty coat of paint; there are election ads and TV debates (albeit without the participation of the incumbent and likely winner, Sergei Sobyanin), as well as pop-up campaign booths near the entrance to metro stations. The poster boy of the political opposition, Aleksei Naval’nyi, is running a slick campaign to “change Russia, starting from Moscow”. Amid the polemics over public transport and parks, bike-paths and Moscow’s escalating real estate costs, one issue has dominated the campaign: the place of Moscow’s highly visible, economically marginalised and legally precarious population of seasonal migrant workers. Election season has seen a normalisation of anti-migrant sentiment that had previously been confined to the far right. These include the publication of some questionable data (such as the claim that half of all crime in Moscow is committed by out-of-towners in Naval’nyi’s election manifesto) and calls by several of the mayoral candidates for the introduction of a visa regime with the states of Central Asia—states that are today some of the most remittance-dependent in the world. In recent weeks, there have been highly publicised raids on markets and at metro-stations and vigilante sweeps of migrant apartments. Video footage shows scores of Central Asian labour migrants being frog-marched, prisoner-of-war style through a Moscow suburb. A huge tented community of 600 mostly Vietnamese textile workers, growing by the day, has been constructed in Eastern Moscow as a holding centre ahead of deportation, one of eighty planned across the country. The mayoral candidate for the Liberal Democratic Party has urged that the migrants detained there be given survival rations and be made to work “for the good of Moscow” before they are deported. These populist public crack-downs on illegal residence and labour in the city belie a profound tension at the heart of Russian migration policy. On the one hand, fears of demographic decline, depopulating mono-industry towns, and an oil-fuelled building boom have generated huge demands for low-paid, un-unionised and tractable migrant labour. Whole industries, including market retail, catering, cleaning, and construction, have come to rely upon seasonal migrant workers from poorer states to Russia’s south, often employed in sweat-shop conditions. There have been simplified procedures for some post-Soviet citizens to receive Russian citizenship, and ethnic Russians in former Soviet states have been actively courted as compatriots to be helped with finding housing and work in a “motherland” where most have never previously lived. On the other hand, politically restrictive quotas for documented, legally recognised labour, and the lack of a minimum wage policy mean that those (mostly non-Slavic) seasonal migrant workers who cannot access privileged routes to citizenship are often, of necessity, working or living in conditions that are in violation of civic administrative codes. There is a stark political economy to the illegalization of migrant labour that goes unremarked in much of the election-season hand-wringing over the city’s growing population of nelegaly (“illegals” in derogatory officialese). For one thing, demand for labour that is low-paid, verbally contracted, un-unionised, and flexible far exceeds the city’s (deliberately minimalist) quota of work permits. Perhaps as many as four fifths of the city’s migrant workers are therefore employed without an official work permit, or individual patent permitting private employment. There is an open market for official work permits, as well as a (near indistinguishable) market for fakes. As I have explored in my research on the difficulty of creating documented selves in Russia, the degrees of intermediation for obtaining a work permit means that “cleans” and “fakes” are often distinguishable only at the point that they are checked by the police. 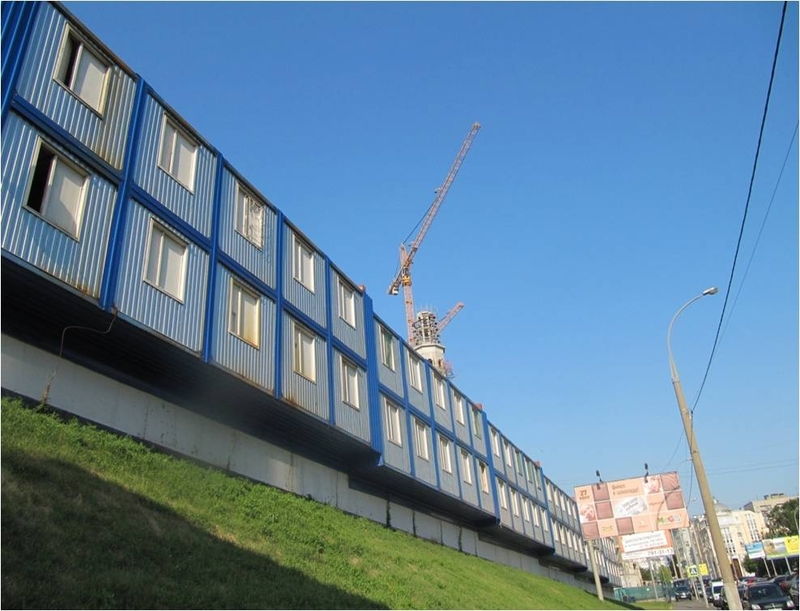 At the same time, the gulf between average wages and average rental costs in the city mean that many migrant workers live in conditions that violate administrative regulations: in multi-tenant “rubber apartments” (rezinovye kvartiry) without corresponding residential registration, in container-dormitories on building sites, or in the unventilated basement of a multi-storey apartment building entirely unrecorded within city housing stock. The choices here are stark: for those on a typical migrant wage in the catering sector of 15-17,000 roubles (around £300-£330 per month) the only way to make ends meet in a context where the rental costs exceed average wages three or four-fold is to share an apartment illegally with 15 or 20 other tenants, paying money to a notional “landlord” (another migrant who takes a cut) and paying off the local policeman to ensure that the apartment is protected from raids. 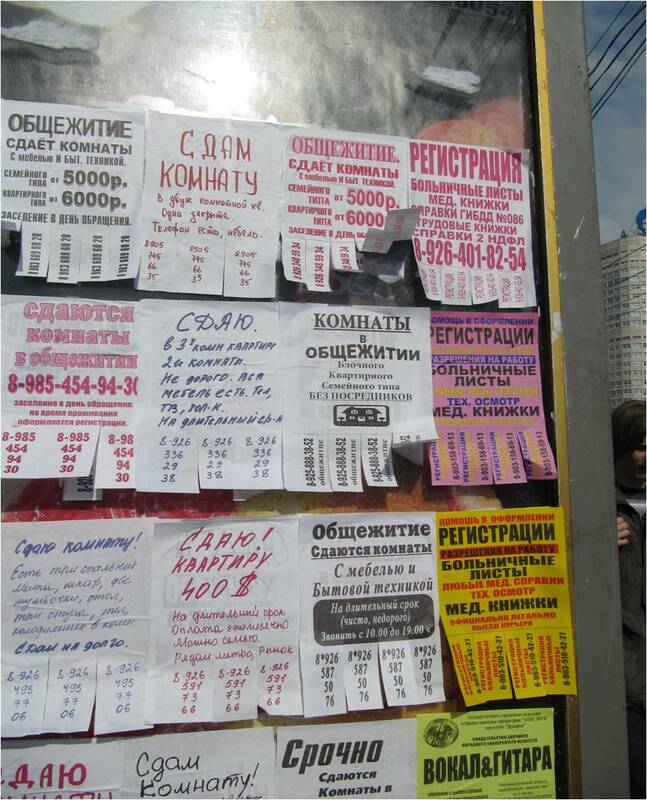 In a city where the 2010 census identified over 92% of the city’s registered population to be ethnically Russian (russkii), the economic constraints upon legal migrant labour have made for an easy popular conflation between being visibly non-Russian, being a “guest worker” (gastarbaiter), and being an illegal. You’ve not answered my previous questions [about how the mayoralty has been stealing paving slabs and trees]. But maybe you’ll answer me this, why you with your jobbing Uzbeks you are stealing our Navalnyi banners from the balconies of people who’ve put them there? As we know, you have given the order for the head of the building administrations to take the banners from balconies. 2. It is dangerous. Your Uzbeks are rock-climbing without any safety nets for this kind of work. They’ll fall and kill themselves. Sobyanin’s and Navalny’s tone and intended audience are quite different here. And yet both rely on a series of reflexive conflations about culture, labour, exploitability, and the capacity (or not) for “adaptation” of non-Slavic migrants within Moscow society. In this mayoral race, as in so many others in European capitals, sustained debate about what an economically vibrant and socially inclusive city might look like has been sidelined in favour of politically dubious stunts to look tough on irregular migration. In a context where whole industries depend on migrants’ documentary illegibility (and economic quiescence), it is the city’s non-Slavic migrants themselves who are bearing the brunt of this political experiment. This entry was posted in News & Updates on September 5, 2013 by citiesmcr.